Following a tumultuous week in which the United States openly accused People’s Liberation Army members of participating in an industrial espionage effort, and historic joint naval drills held between China and Russia were held, the ruckus over the South China Sea isn’t winding down. Despite the bolstering effects of a newly minted U.S.-Philippines defense pact and the successful conclusion of the Balikatan 2014 annual exercise, Philippine military reconnaissance photos confirmed China is reinforcing its hold over Mabini (Johnson South ) Reef in the contested Spratlys by reclaiming an area large enough to establish an airfield—either for resupplying other outposts or creating a much desired air defense zone. 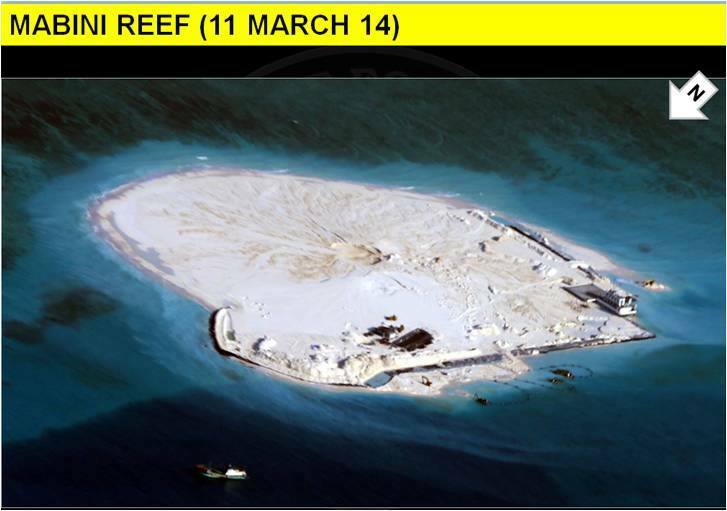 As a secondary effect, the act of converting the reef into a reclaimed “island” potentially alters the basis by which the Philippines raised its territorial case to the U.N. Convention on Law of the Sea (UNCLOS) court. If the “island” is recognized as a valid geographic feature, China could make a case for establishing a 200 nautical mile Exclusive Economic Zone (EEZ) based around the reclaimed area. The Philippines’ case rests on the idea that individual reefs or projections above the sea do not constitute such features, and ownership of the same is based upon whether they fell into internationally recognized EEZs. The political fallout is also affecting the general populace and commerce in the region. In a hotly contested incident, the Philippine National Police recently rounded up turtle poachers in the area, and are holding eleven Chinese fishermen in custody, at the same location where a Chinese frigate ran aground in 2012. Notably, a Philippines poacher boat and crew were also picked up in the sweep. Nonetheless, Beijing claimed premeditation and demanded the immediate release of crew and boat, stating the arrests were “dangerously fraying” relations between the two countries. The preliminary investigation indicated collusion between the two groups of fishermen, and highlights the challenges of establishing maritime domain awareness. In April of 2013, a Chinese poacher boat ran aground on Tubbataha Reef, the same dangerous ground that claimed the minesweeper USS Guardian. That poacher boat was flying a Philippine flag to fit into local traffic; Armed Forces of the Philippines (AFP) military sources say the PRC often sends false-flagged civilian boats into the region on intelligence-gathering missions around the nation’s oil rigs and other sensitive areas. And befitting current times, the brouhaha has been extended to the cyber-dominance realm. The Philippines branch of the global “hacktivist” group Anonymous claimed to have defaced several hundred Chinese government websites in retaliation for Beijing’s recent provocations. While that event is mostly a happy accident for the Philippines, the AFP has been taking cyber-security seriously and symmetrically countering the PRC’s strengths in this domain by reputedly using a combination of air-gapped computer networks, cell phone prohibitions, and hard-copy memos delivered by physical couriers; especially at commands involved in Western Philippine Sea operations. Despite those practices however, the successful Ayungin Shoals resupply mission reportedly was compromised through intercepted communications. In other developments, the Philippines’ strategy to improve its standing in the regional conflict is building momentum. AFP Chief of Staff Lt. Gen. Emmanuel Bautista recently called out a few specific locations where the United States could conceivably preposition forces and material under the new defense pact. San Antonio Naval Education and Training Center (NETC) lies approximately 119 nautical miles from the contested Scarborough Shoals, where the U.S. Navy recently detected the presence of two Chinese frigates, a move to counteract further successful AFP actions such as the highly publicized resupply of the beleaguered marines at Ayungin Shoals. Other facilities named by Bautista include the tiny but critical Oyster Bay naval base, which faces directly into the Spratlys. Fort Magsaysay, where the recent Balikatan joint drill was held, also tops the list. The finalized list of sites is yet to be publicized, and may be the subject of negotiation should the United States feel other sites would be more suitable. All the bases require significant rehabilitation and upgrade, which may benefit from the defense pact clauses where the United States could pay for the upgrades in order to properly house and pre-position U.S. military assets. Finally, the modernization effort of the AFP to build a credible defense of their territory continues to expand. The highly anticipated bid for a pair of Anti-Submarine Warfare (ASW) helicopters and two Long Range Patrol Aircraft (Adobe PDF) were released. Indications are strong that the Philippines is also seeking to duplicate its recent success of bolstering Patrol Force assets by requesting yet another Hamilton-class cutter due for retirement from the U.S. Coast Guard. That would be in addition to the two new-build guided-missile frigates currently awaiting vendor down-select. Additionally, a Coast Watch System comprised of four Littoral Observation Stations with surface radars is being eyed for the critical island of Palawan, where Oyster Bay naval station is located.